There is a special glow. It always appears in the eyes of Faramarz Mozaffarian when he speaks of jewellery, of beautiful work in gold or platinum, graced by fine diamonds or with vibrant precious stones, set as solitaires or combined with one another. These splendid treasures never fail to bring a gleam to the eyes of the man who founded Juwelier CABOCHON 25 years ago. That glow is the result of a lifelong passion, passed on in the family from generation to generation. This passion lives on in the present, it burns in the hearts of the Mozaffarian family, and continues to spur them on to new brilliant achievements. The history of the family that has dedicated itself to jewellery and jewels stretches far back into the 19th century. 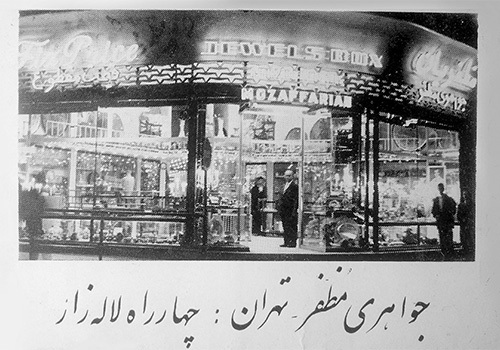 Faramarz’s grandfather opened his first store in Tehran, Persia in 1883. Even at that time, the city south of the Caspian Sea was the largest in the country with an astounding 100,000 inhabitants. A bustling and fascinating metropolis and centre of trade. The eldest if his nine sons, Morteza, worked diligently in his father’s shop. He learned everything there was to know about jewels and jewellery and ultimately founded his own jewellery business. At the beginning of the 30s, he settled in Isfahan, an old, magnificent city on the historic southern route of the Silk Road. 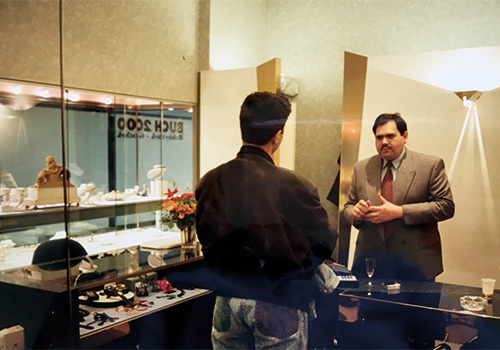 “My father was an excellent businessman”, his son Faramarz remembers. With his great knowledge and experience, Morteza was quickly very successful. He opened another store in Maschhad and returned to Tehran at the beginning of the 40s in order to open a third store there in the centre of the city, and an additional one in the bazaar. 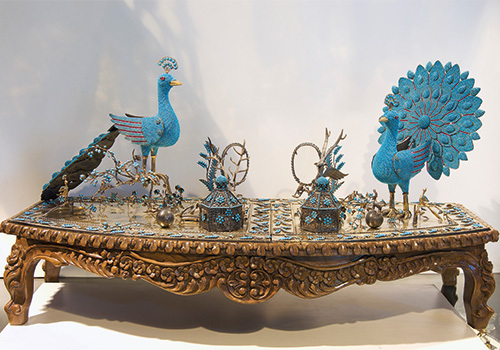 With his fine sense for trends and developments, Morteza recognised that many international guests were impressed by the sights of the city, the palaces and mosques, but also the extraordinary traditional handmade artwork and exceptionally beautiful jewellery. He went where the guests were and operated boutiques in the largest hotels of international chains like Hilton and Intercontinental into the 60s. The most impressive feature of the business was the top floor, which housed a private museum with valuable furniture from European royal houses and unique pieces such as those by Fabergé. The extraordinary assortment in this special store also included fine bowls, vases, and coffers of chased silver, for which Persia is famous. And there were turquois stones, which were the great love of the jeweller Morteza Mozaffarian. The beautiful stone with its characteristic brilliant blue, which ultimately gave this colour its name, was exported from Persia 2,000 ago. Even today, the most beautiful examples of turquois are found in Iran. What could have been more natural for Morteza than to lease a mine? He had the impressive finds made into magnificent jewellery and exquisite decorative objects, which his customers loved. The stones were processed in his own grinding shop. As turquois is soft, it is not suitable for faceting. Therefore, they are processed as CABOCHONs, ground round or oval with a flat bottom and a domed top. With the name that Faramarz Mozaffarian gave his own company decades later, he makes reference to the great passion of his father. Morteza retired at the proud age of 88. The revolution had changed many things. The big store was closed. Morteza brothers were spread across many countries, the nine sons became independent and traded in jewellery in other places. For Faramarz Mozaffarian, the youngest, 1990 was a year of change. He was married and the proud father of two small daughters. One if his older brothers had already emigrated to Germany and had settled in Hamburg due to the excellent doctors. The young family had visited him many times and was very impressed with the Hanseatic city. So Faramarz and his wife Zari and two small daughters, just one and five years old, settled in the Hanseatic city eager to make a new start. This didn’t come easy, but they had a strong will to succeed. The young entrepreneur started his success story in a space 30 very exclusive square metres in the popular “Hamburger Strasse Shopping Centre” – now the “Hamburger Meile”. His extensive experience from his father’s business, his sense of style, and particularly his keen eye for the quality of precious stones and jewellery allowed him to choose the right pieces at international trade fairs and have them processed by the best goldsmiths in accordance with his own designs. His Hamburg customers were ecstatic. In addition to classic gold and diamond jewellery, there were also pieces with coloured stones which created excitement with their all-new, very modern look. In 1996, Faramarz Mozaffarian took the next development step: The assortment was expanded to include watches. Five years later, the space was ultimately too small and was expanded to twice its size. The assortment of watches was expanded to include top international brands. And things continued to grow – thanks to the extensive expertise of Faramarz Mozaffarian, his constant efforts and commitment. And thanks to his wife Zari: She took care of the family and supported her husband, not just during the day but also in the evenings when he ambitiously studied German in evening classes. Monika Habicht has been another important source of support for the family for a quarter of a century. She has been there practically since the day the business was founded, has been faithful to the aspiring company, and became a member of the CABOCHON family. She has now retired, but regularly comes in to support the store. A special relationship that endures. With the beginning of the new millennium, Juwelier CABOCHON receives a new facet: Zari Mozaffarian joined the company and has been managing it together with her husband since then. She is a wonderful connoisseur of jewels and brings her own sense of aesthetics to the selection and arrangement of the pieces of jewellery, advising customers in an insightful manner. The successful couple took the next big, important step in the year 2006: they moved into the newly opened wing of the Alstertal Shopping Centre (AEZ). The Mozaffarians opened their new, elegant store in a space of 90 square metres in a prominent position with an impressive row of display windows. Here, the diamonds glitter, the gold shimmers, and the gems sparkle more brilliantly than before. The dream of having an individual specialised store, which precisely fulfils the wishes of the customers came true. Jewellery and watches by renowned international brands shine in the displays – crowned by the extraordinary pieces of jewellery that were designed in accordance with the stipulations of the Mozaffarian family and for which they have searched the globe for the most precious stones and the fines materials. However, ten years of success and the happy customers in the AEZ are no reason for Faramarz Mozaffarian to stand still. After the renovations and modernisation of the store this summer, an even more expanded assortment will be presented. In the meantime, Faramarz’s daughters are now grown. Sadaf, the eldest, studied business management in London, works for a large software group, is married, and has now given the Mozaffarians their first grandchild. The youngest daughter, Setareh, followed the family tradition. Early in life, she experienced the same fascination that held her ancestors spellbound. After graduation and after studying gemmology in London, training with a renowned jeweller in Münster and another in Düsseldorf, she came back to Hamburg. She has been working for three years beside her parents and has enriched Juwelier CABOCHON with her expertise and the point of view of the next generation. Setareh’s main focus is on watches, the precision of which delights her and which she studies in detail. But, she is also an expert in jewellery and knows exactly which trends are coming and how best to wear these. 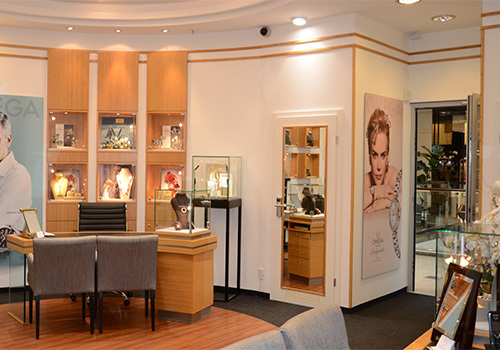 She loves advising the regular customers of Juwelier CABOCHON and has made it her goal to get young people interested in the fascinating world of jewels and watches. The spark of jewellery passion has taken hold in the fourth generation and now glows brightly as it did with Faramarz Mozaffarian and his forefathers. Bright prospects for Juwelier CABOCHON.